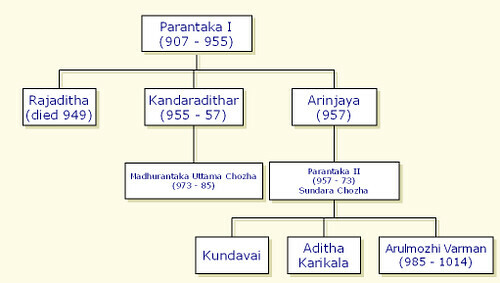 Besides these, there are other characters like Maduranthaka Thevar, the son of Kandaraditha and the man whom the conspirators want to crown king, and Anirudha Brahmarayar, Sundara Chozhar’s Prime Minister and the man who has eyes and ears everywere. But the most wonderful character in the book is Brahmarayar’s spy Azhwarkadiyan Nambi, a Vaishnavite, who roams around the country challenging Saivaites for debates. He collects information for the Prime Minister and is always around Vandiyathevan, rescuing him during trouble. There are some lovely women too, like Vanathi, the Kodumbalur princess who is in love with Arulmozhi, Poonkuzhali, the boat woman who rows the future king to Lanka, Mandakini, the deaf and dumb step mother and Rakkammal, the wife of a boatman who supports the Pandya conspirators. Most memorable among these is Nandini, who has the power to make influence any man. With the help of a boat girl, Vandiyathevan reaches Sri Lanka and meets Ponniyin Selvan and becomes his close friend. In Lanka, Ponniyin Selvan realizes that his father had spent some time in an island near Lanka and had been with a girl born deaf and dumb. He meets her and realizes from her drawing that he had two children. Who are those children and do they have the right to the throne? Later one day in Thirupurambayam forest Vandiyathevan seens Nandini and the Pandya conspirators place a small boy on a throne and take a vow in front of him. Who is this boy and what right does he have to the thone? This is the kind of suspense that is maintained throughout the novel. While coming back from Lanka, Ponniyin Selvan is caught in a cyclone and goes missing. Rumor spreads that he is dead, but he survives and stays at Choodamani Viharam, a Buddhist monastery in Nagapattinam. Then slowly the dispersed family starts asembling. The conspirators meanwhile choose one day in which both the king and both his sons would be assasinated. Will the conspirators succeed in killing Sundara Chozha and crowning Madhuranthaka as the king or will Ponniyin Selvan be the king? That is the summary for the story. But then it is not that simple either for all the people in the novel have long histories of interaction with each other and everything is not as black and white as it seems. There are new revelations and relations being established all the time. and even when you think you can predict what is going to happen, new surprises pop up. Even though this is a work of fiction loosely based on historical facts, some incidents are left without a closure such as the question – who murdered Aditha Karikalan. Various people confess to doing it, but even at the end, a doubt remains. The three strengths of Kalki are plot, characters and dialogue.There is not even one dull moment in this 1800 page book. Suspense is maintained throughout the novel and when you think you have understood his techniques, the characters themselves reveal that they are not who you think they are. Even the last book is a page turner due to the unexpected turn of events. For a novel of this size, there are many characters like spies, magicians, warriors, soothsayers and Buddhists, and since the novel is this big, we get to know each of them very well. The dialogue between the characters are very poetic which looks odd in English. I am sure would have sounded beautiful in Tamil. There are couple of points of irritation also. The author for some reason decides to pop into the novel at some places and give some commentary which is sometimes a detail about history, or a rationalization of events. This intervention broke the flow and I felt would have been more appropriate as an appendix or a separate article. In the book, Vandiyathevan goes to Sri Lanka in a boat rowed by the boatwoman Poonkuzhali, but there is very less detail of the type of boat or how they were able to navigate the ocean. In many places such technical details are glossed over. This was originally published in Tamil, but thanks to the translation by C.V.Karthik Narayanan, non-Tamil reading people like me can enjoy this classic work. People who can read Tamil have certified that this translation is excellent. Though this book is quite lengtly, (6 books, each of about 300 pages), it is a page turner. This was my first Indian historic novel and it gave a good idea of the Chola dynasty in a non-boring way. Ravages, Now the goal is to read the other two historical novels by Kalki. If you know where I can purchase it online or in any store in Chennai, please let me know. 1. Parthiban Kanavu is apparently available in several stores in Chennai in 2-3 translations in English. Havent read any of them, so can’t specifically recommend one. 2. For Sivagamiyin Sabadham – have you seen the online translation – its on a blog! Translated by this blogger called Pavithra Srinivasan – http://sivagamiyin-sabadham.blogspot.com. In my opinion, a VERY good translation. Pavithra translates and puts up one chapter of the book at a time……Though I dont know how much is now accessible on the blog – the translation is now getting published and some of the earlier stuff was being moved off the blog, cause the translation was now being copyrighted…..you should check…..
English translations of the other two novels – sivagamiyin sabadham and parthiban kanavu – have not been published yet. bala, Nandu, Thanks for the links. It was mentioned to me last year by someone. Somehow I prefer the printed book.